At the beginning of 2016 the Law Society of NSW established an Elder Abuse Working Group. I’m pleased to chair that small but dynamic group, which also consists of Ruth Pollard (NSW Trustee & Guardian), Sue Field (Western Sydney University) and Ray Ward (Lawcover). We put together a program of seminars for solicitors. They are aimed at helping solicitors helping clients avoid elder abuse. 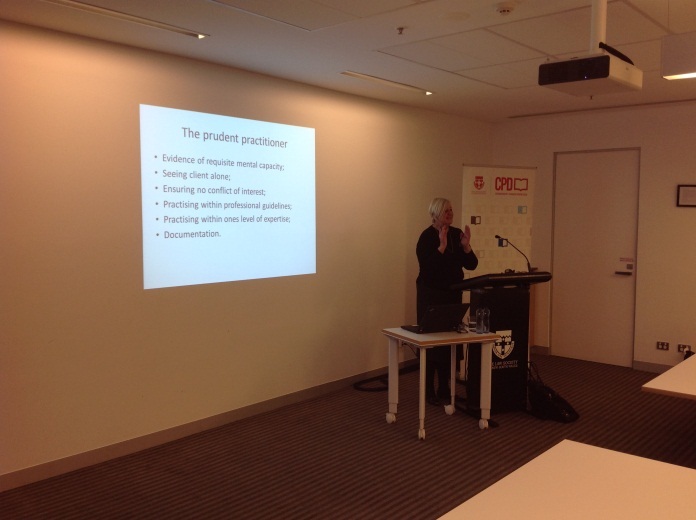 The first seminar was conducted on 21 September when Sue Field presented the topic of Elder Abuse and the legal practitioner at a breakfast CPD session in Sydney. The feedback was exceedingly positive. We’re now looking forward to rolling out the rest of the program starting with a Q & A Forum on 9 November 2016. The panellists are Justice Geoff Lindsay from the NSW Supreme Court, a psychologist, Professor Ian Coyle, and Nick O’Neil, formerly the President of the Guardianship Tribunal. One and half hours is set aside to quiz this eminent panel, from 1.00pm that day. The third part of the program is a 3 hour workshop on interviewing techniques for vulnerable clients. This will involve learning and practicing the best approaches to provide most assistance to those who need it most. A precise date is yet to be set, but it’s tentatively slated for February next year. The last part of the program will follow in March: a one hour Ethics seminar addressing the role of the fiduciary, undue influence, conflicts of interest and mental capacity. Another initiative of the Working Group is a handout of web contacts where additional information on elder abuse can be obtained by solicitors and, probably more likely, clients. A series of articles in the LSJ will also alert solicitors to particular risk issues for solicitors. The first article was my piece on Mental Capacity which appeared in September LSJ pp84-85. More will follow. The Working Group has already received suggestions from practitioners about other action that can be taken to assist solicitors assist clients. We will be following up on these suggestions in the next few months. All suggestions will be considered, so please contact me or the other members of the Working Group if you have any ideas for us. Every survey rated the presentation as Excellent. I’m a Councillor of the Law Society of NSW and a member of the Future Committee. The opinions expressed are my own.